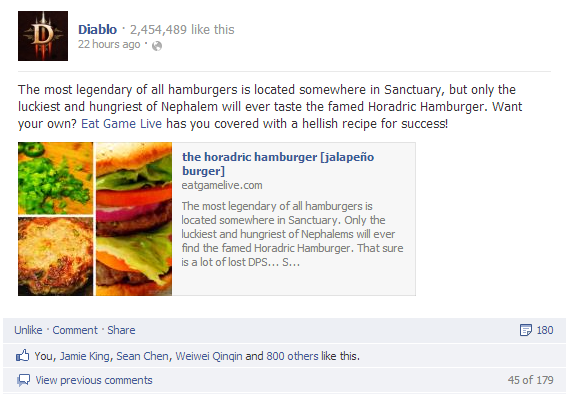 The most legendary of all hamburgers is located somewhere in Sanctuary. Only the luckiest and hungriest of Nephalems will ever find the famed Horadric Hamburger. Since I never found the mythical Horadric Hamburger in the magical pony land, I decided to check the auction house for it. The lowest price was 800,000 gold! WHAT! 800k for a burger? 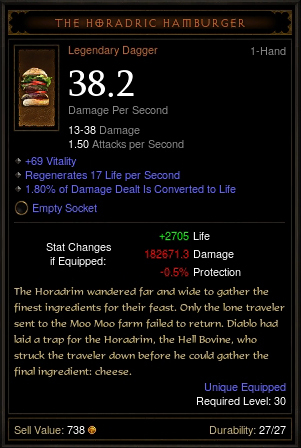 To keep with the Diablo lore, we’re making this burger sans cheese since the Hell Bovine had struck the traveler down before he could gather the final ingredient: cheese. And since it’s comprised of Hell Bovine beef, I’d assume it would be pretty spicy. Thus, we’re lacing these babies with jalapeño peppers. If you’re not a fan of spicy foods, you can always wash the jalapeño pepper interiors very thoroughly and throw away the seeds in order to get rid of most of the capsaicin (the chemical compound that causes the spicy irritation in the mouth). Feel free to crank these burgers up from Hell mode to Inferno mode by increasing the amounts of jalapeño and cayenne pepper (at most double it). 1/4 of a red onion, cut into slices and seperated into rings. Prep work will take about 20 minutes. 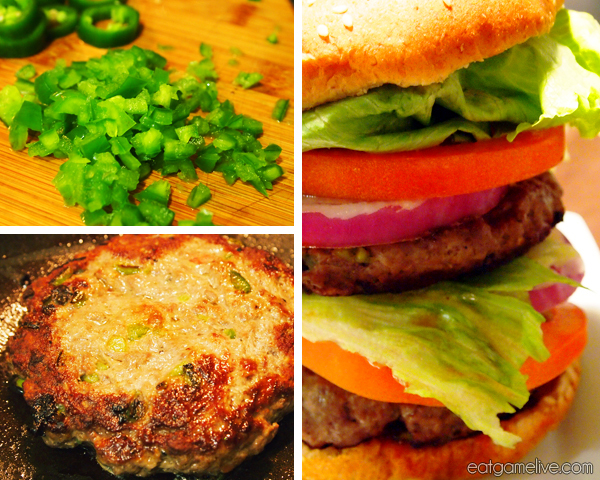 Total cook time will be about 10 minutes per burger (~40 minutes total assuming you’re cooking 2 patties at a time). This recipe will make 4 servings. Place ground beef in a bowl. Season with salt, pepper, and cayenne. Add in your worcestershire sauce. Add in your diced jalapeño peppers and combine with the meat. Take palm sized balls of meat from your bowl. Shape them into burgers. Try to get a consistent size for all of the patties. Heat a large skillet on high heat and add olive oil. Cook your burgers (try not to over crowd your skillet) for about 4-5 minutes* on each side, or until the burger begins to bleed a little bit. Do not flip your burgers more than twice. 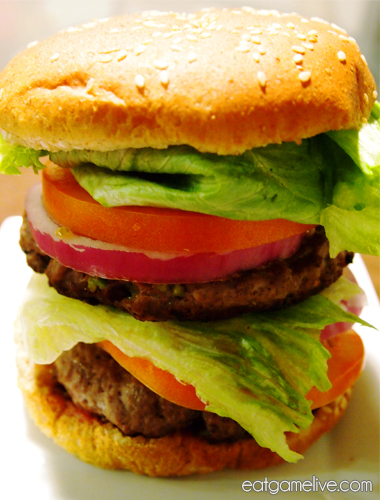 Remove your burgers and set aside to rest for 2 – 3 minutes. *4 minutes per side should yield medium-rare burgers. Build your burger: place 1 hamburger patty on a bun. 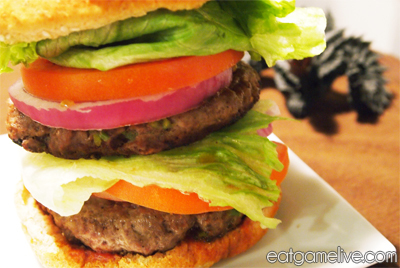 Then, place your lettuce, tomato and onion on top of the first patty. Follow with another patty and lettuce, tomato, and onion on top of the second. Finish by placing the other half of the bun on top. And that’s a GG WP. This burger is the perfect companion to MP1 inferno runs. Who knows? Maybe when you make this burger, you’ll get a better roll than I did. Just remember: Keep calm and FARM MORE because brawling is coming. Oh snap! 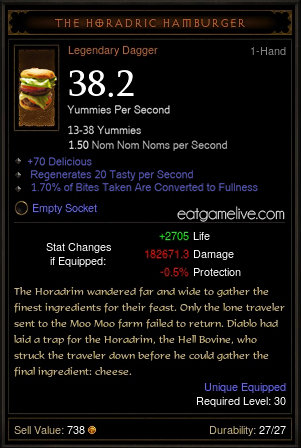 This entry was posted in diablo, sandwich by admin. Bookmark the permalink. Pingback: Diablo3 . com . br – Círculo dos Cinco – Menu do Dia: Hambúrguer Horadric!